Hugo Salinas-Price, a hard currency advocate, and the founder of Mexico’s Elektra retail chain explains in the following guest post how he became a gold bug. My father was Hugo Salinas Rocha -“Salinas” was his father’s surname, and “Rocha” was his mother’s surname; the custom of using both parents’ surnames is universal in Latin America. Father was a successful merchant in Mexico City, and in the 1930’s he ran a store in downtown Mexico City. The store belonged to a company founded by his father, Benjamin Salinas Westrup and to the partner he took into the business, his brother-in-law, Joel Rocha Barocio; the company name used their initials: “SyR” (the “y” means “and” in Spanish). I was born in 1932. As a little boy, I loved to play in my father’s store after school hours, and one afternoon when I was perhaps eight years’ old, one of the salesmen took two gold coins out of his vest pockets (men wore vests in those days). They were the large, 1.2 ounce gold “Centenarios” that had been minted to celebrate the 100th Anniversary of Mexican Independence from Spain in 1810. The salesman balanced the two coins on his forefingers, and placing them near my ear, he gently touched one against the other. The sound was the delightfully pure ringing of gold! A couple of years later, when my father was driving home after the store closed, he pulled out a lottery ticket from his coat and said: “This lottery ticket did not win a prize, but it did win a refund of 100 pesos. I’ll give you the refund. What would you like to buy with the refund?” I unhesitatingly replied: “Buy me some gold coins!” So the next day, a salesman from my father’s store took me on a short walk downtown, from the store to a side-street. Three or four men in suits and wearing hats – men wore hats in public, in the 1940’s – were posted along the sidewalk, and were clicking gold coins in their hands. They were gold-traders, and clicking gold coins was their way of attracting the attention of customers. At that time, the silver pesos we used as money could be exchanged for gold pesos at a rate of five silver pesos for one gold peso. 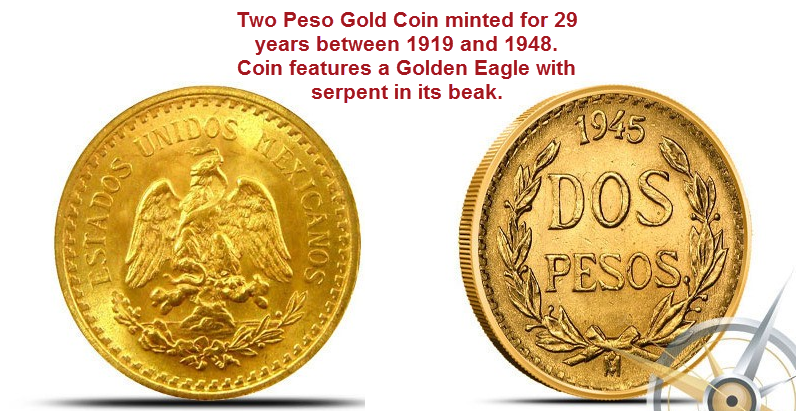 The smallest gold coin was the 2 peso coin, with 1.5 grams of pure gold content, so each one cost ten silver pesos. Thus, on a sidewalk in downtown Mexico City, my gift of 100 silver pesos was exchanged for ten 2 gold peso coins. I went home with my gold coins, and promptly put them in my father’s safe, to which he gave me the combination. They were really the only thing of value in the safe, and from time to time, I used to open the safe to examine the beautiful gold coins. So that’s how I became a gold-bug at age 10. When I was 14, in 1946, I was taken to school to my mother’s home-town in the US. The only person I knew there, was my maternal grandmother, but everyone knew who I was – the son of Norah, the Price girl who married a Mexican in 1931 and went off to Mexico to live. I was at school for three years of high school, and very much enjoyed my time there. What happened to my little stash of ten 2 peso gold coins? I still have them, after all these long years – I am now 84. Slowly but surely, they are growing in value, and they are still obtainable today, in exchange for 1,523 pesos each as of this date. These are really 1,523,000 pesos if we take away the artificial revaluation of our Mexican money in 1993, when every 1000 pesos was converted into 1 “new” peso. So my gold coins went from 10 silver pesos in 1942, to 1,523,000 paper pesos in the course of about 74 years. The original post is at Hugo’s Plata website, How I Became a Gold-Bug.